Located near the cities of Palmer and Glennallen, Alaska approximately 100 miles northeast of Anchorage, Matanuska Glacier is the largest glacier that is accessible by vehicle within the United States and one of the state’s top attractions. More than 100,000 glaciers are located within the state of Alaska, covering more than 3% of the area’s landscape. The Matanuska Glacier stretches 27 miles across by four miles wide at its maximum, with an average width of two miles. Its origin is located within South Central Alaska’s Chugach Mountain range, with its terminus feeding into the nearby Matanuska River. In contrast to the majority of Alaskan glaciers, which are alpine glaciers located off mountain slopes, Matanuska Glacier is a valley glacier located on top of a valley floor. The history of human occupation within the Matanuska-Susitna Valley area spans back at least several thousand years to the arrival of the Ahtna Athabascan indigenous tribe, which followed caribou and salmon populations to the Matanuska River area. In 1741, Russian explorers arrived in the area, and by 1910, American settlers began populating the area, establishing railroad lines and trade routes. The area is best known in modern American culture for the 1935 Matanuska Colony Project, an initiative by President Franklin Delano Roosevelt to give 203 welfare families from the Midwest a new start with a 40-acre land plot, a house, and a barn. Though more than 60% of participants abandoned their properties within the first three years of the project, several farms from the project are still standing in the area today. Today, the Matanuska Glacier is the largest vehicle-accessible glacier within the United States, visible from the nearby Glenn Highway National Scenic Byway. The glacier advances at a rate of approximately one foot per day, taking 250 years for ice to travel from its origin to its terminus. It began its retreat to its current location approximately 10,000 years ago and has not seen significant mass change within the past two decades. As cold air from inside the glacier works to force warm air upward into the surrounding mountain peaks, the weather near Matanuska Glacier is known for its sunny skies and favorable weather, making it one of the state’s top tourist destinations. A number of pullouts along Glenn Highway allow for photo opportunities, as the glacier can be seen from several miles away. Among the highway’s pullouts is the Matanuska Glacier Scenic Turnout, which fits six cars and provides the closest vehicle viewpoint of the glacier from the road. Up-close photo opportunities are also provided at the glacier’s edge, located approximately two and a half hours from Anchorage. As the glacier resides on private land, an access fee is charged for exploration of the immediate glacier area. Several park areas are located near the glacier, including the Matanuska Glacier State Recreation Site, which is managed by Long Ridge Rifle and located at mile marker 101 along Glenn Highway. The site encompasses approximately 229 acres and offers an Edge Nature Trail that runs parallel to the glacier and the Matanuska River. 12 campsites are located at the park, along with fire pits, picnic tables, and restroom facilities. Interpretive signs detailing area natural and glacial history are located throughout the park, along with viewpoints for telescopes and handicap-accessible walkways. In addition to offering some of the safest viewing opportunities within the region, the site offers opportunities for summer and winter sporting activities, including hiking, river rafting, skiing, and snowshoeing. 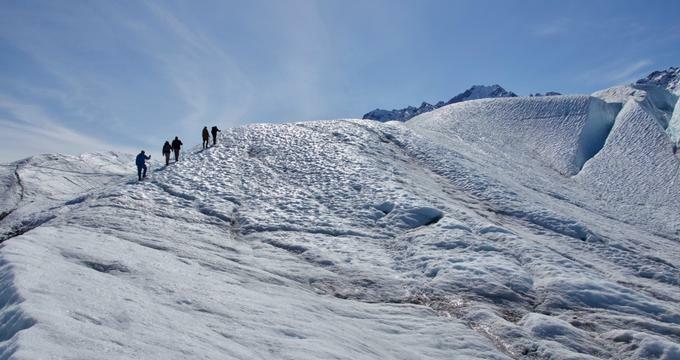 At mile marker 102, the Matanuska Glacier Park allows visitors to explore the glacier on foot, either via independent exploration or as part of guided tour packages. Hiking time to the glacier from the park is approximately 15 to 20 minutes, though independent exploration is not recommended for beginning hikers. Day trip tours are offered for visitors of all mobility levels, with tour guides sharing information about glaciology and area history. Ice climbing instruction is also offered by park guides. Other nearby attractions include the Lion’s Head Trail, a rock outcropping area that offers a one-hour hiking climb to a 2,000-foot cliff lookout over the glacier. Panoramic views encompass the Matanuska River, the Talkeetna and Chugach Mountain ranges, and Caribou Creek. ATV tours, ziplining adventures, and whitewater rafting excursions are offered in the nearby community of Glacier View. The nearby Sheep Mountain Lodge, open for more than 70 years, features luxury cabin and RV accommodations and a restaurant serving authentic Alaskan seafood, homemade desserts, and beers from the Alaskan Brewing Company. More than eight miles of trails also embark from the lodge’s trailhead, offering self-guided hiking experiences and wild berry picking excursions.